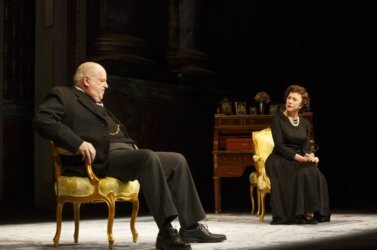 "The Audience," Peter Morgan's new play about Queen Elizabeth and her prime ministers, has excellent performances by the supporting cast and impressive design elements by Bob Crowley. To say nothing of those adorable (and mostly extraneous) dogs who scamper enthusiastically across the stage. But the main reason for seeing "The Audience" is to watch Helen Mirren ply her trade. Helen Mirren and Michael Elwyn. Photo by Joan Marcus. "The Audience," which has transferred to Broadway from London's West End under the direction of Stephen Daldry, brings along Mirren, who won an Oscar for her portrayal of Elizabeth II in "The Queen" and an Emmy for playing Elizabeth I in a TV mini-series of the same name. Who would expect her performance to be anything less than dazzling? 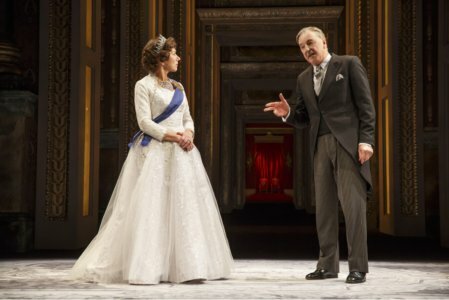 The play begins with the lines, "Every week the Queen of the United Kingdom has a private audience with her Prime Minister. It is not an obligation. It is a courtesy extended by the Prime Minister to bring Her Majesty up to speed. The meeting takes place in the Private Audience Room located on the first floor of Buckingham Palace." That and a bit of English history is all one needs to understand most of the action in the "The Audience." Except for a few encounters between Queen Elizabeth and the young, somewhat rebellious Princess Elizabeth (Tracy Sallows/Sadie Sink), and a scene in the Queen’s Balmoral Castle in Scotland, the play consists of private interviews the queen had with British prime ministers from Winston Churchill (Dakin Matthews) to David Cameron (Rufus Wright). This gives Mirren the opportunity to make those breathtaking transformations, turning a 69-year-old actress into a 25-year-old bride or a napping 86-year-old queen. ame is particularly heartfelt. But none can be considered particularly authentic. After all, these meetings were private. Dakin Matthews and Helen Mirren. Photo by Joan Marcus. We see Anthony Eden's (Michael Elwyn) machinations in the Suez, Harold Wilson's (Richard McCabe) battle with Alzheimer's, John Major's (Dylan Baker) self-doubts. The Queen is witty and insightful throughout. She is clearly aware of her privilege and limited power. She gets to sit first, but she seldom gets her way. While most of the prime ministers come off as human and well-meaning, if not exactly noble, Judith Ivey as Margaret Tatcher is particularly strident. Was the woman really that awful? Maybe, but it doesn’t help the play that her scene with the Queen looks like a conversation between Glinda the Good Witch and the Wicked Witch of the West. Another problem is the decision to end act one with Queen Elizabeth's coronation. As the saying goes, that’s a hard act to follow. If it weren't such a pleasure watching Mirren, one could easily wonder why the audience is called back after intermission. In fact, for a plotless play, "The Audience" goes on a bit too long. But that just gives us more time to watch the inimitable Ms. Mirren.